ClipSpeak is a portable, simple, easy to use, free application that reads out any text you select and copy to the clipboard. The software allows you to select any text in word processors, web browsers or other applications, copy it to the clipboard and it will automatically read aloud the desired number, letter, word or sentence using its text to speech engine. 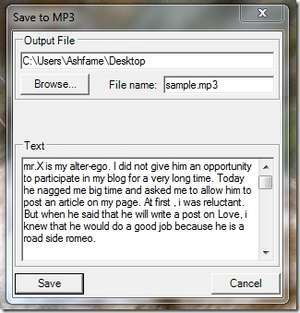 There is an internal text editor available that enables the exporting of any typed text to MP3 format. Users can select the type, volume and speed of the voice and create high quality audio books. Version 1.5 is a freeware program which does not have restrictions and it's free so it doesn't cost anything. For security reasons, you should also check out the ClipSpeak download at LO4D.com which includes virus and malware tests. Additional screenshots of this application download may be available, too. Featuring the very best in free tts program downloads. Editing staff adds reviews and free download links and constantly updates software. Check out some of the freeware downloads available in the tts program category. They contain no strings and are available at zero cost. ClipSpeak has a presence on social networks.